With its all-black metallic finish with flashy red backlit controls and white silk-screen print, chrome pots and wooden casing (the side panels and underneath the keyboard), the Prophet 12 is one of the most beautiful — if not the most beautiful — synth we've had in our hands. Indeed, the manufacturing quality looks professional at all levels. The controls are plentiful: 44 pots, 15 rotary encoders and 58 buttons (some of which are backlit). The encoders are not screwed to the panel and the axis is a bit loose, but nothing to worry about. 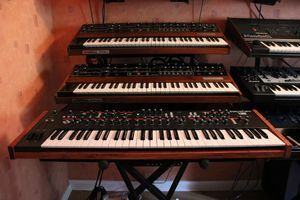 The pots resemble those of the Prophet 5, with their chromed top and striped body, but a bit smaller. 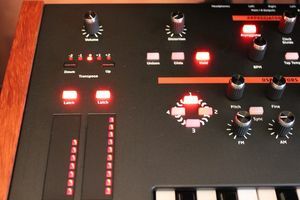 The synth glows with a constellation of backlit red elements: loads of LEDs (some of which blink in rhythm), two backlit wheels for pitch bend and modulation, two vertical touch sliders with LEDs (position- and pressure-sensitive and with position lock key), a big, translucent "12," LEDs enslaved to the voices... impressive! A graphic OLED display occupies the central position; it is a bit small but perfectly readable thanks to its very high resolution and great contrast. 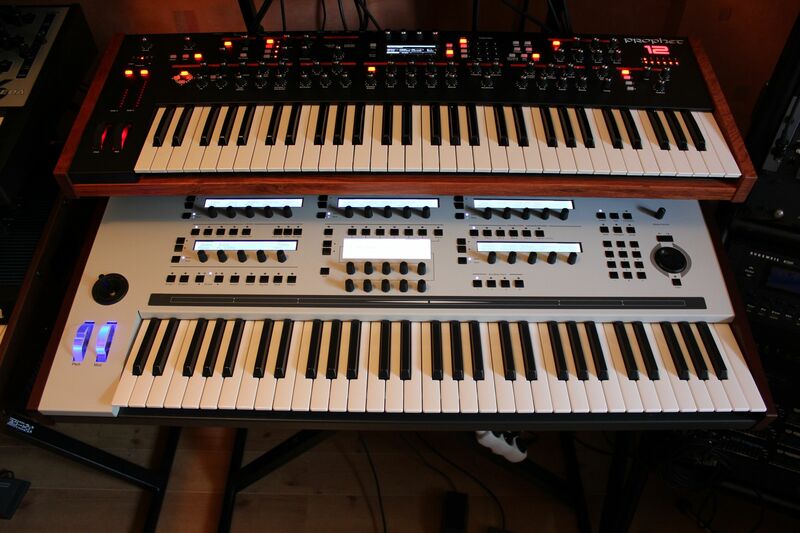 The 61 weighted-key keyboard is very pleasant, with a nice key action and good dynamics, the keys respond perfectly to velocity and pressure. On the rear panel we have the classic, no-frills connections, from left to right: IEC AC power inlet (universal internal power supply, a nice first from DSI! 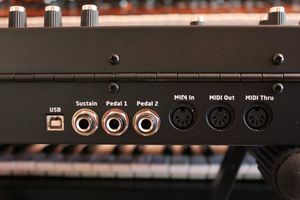 ), a USB port, three pedal jacks (one Sustain/footswitch + two assignable to continuous values), a MIDI trio and five audio outputs on 1/4" jacks. The first four jacks (TS unbalanced) are configured as line-level stereo output pairs, so each program layer has its own independent stereo output. The last jack is the headphones output (TRS). A reassuring point with regard to the jacks is that all of them ares firmly screwed to the panel. Programs comprise one or two sound layers: the first own has priority when editing. However, we can edit either one or both at the same time. 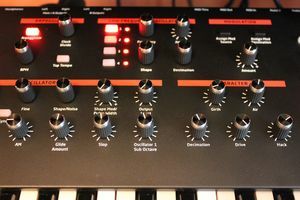 We can also easily copy one layer unto another one, swap them, adjust their volume, modify the split point, change one of the two programs… Certain modules of the Prophet 12 share controls: oscillators, LFOs, auxiliary envelopes… but it isn't much to worry about, for several reasons: to begin with, we usually deal with encoders for such controls, which avoids jumps; secondly, because there are some clever editing tricks, for example: pressing and holding one of the four oscillator selectors, we can edit all four oscillators simultaneously, so when we modify an encoder, the display shows the same parameter for the four oscillators, which we can edit with the four soft knobs on top of the screen. The same applies to the LFOs, by pressing and holding all four LFO selectors. The "Show" function allows us to read parameter values when we move a control, but without modifying the sound, obviously. 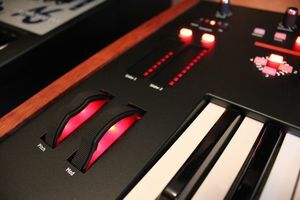 The "Revert" function allows us to go back to a parameter's stored value by simply pressing the Revert button and turning the desired knob. Potentiometers work with one of the three usual modes: jump, relative and passthru. 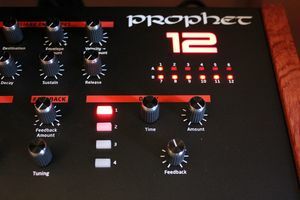 The Prophet 12 comes with four banks of 99 read-only programs and four banks of 99 user programs. First observation: the audio level is very high! The factory sounds aren't very useful nor convincing, it's a pity they can't be overwritten. After having browsed all of them, we were tempted to create something that does not exist by default: warm and fat sounds! Not so simple... the sound is colder than that of previous DSI. 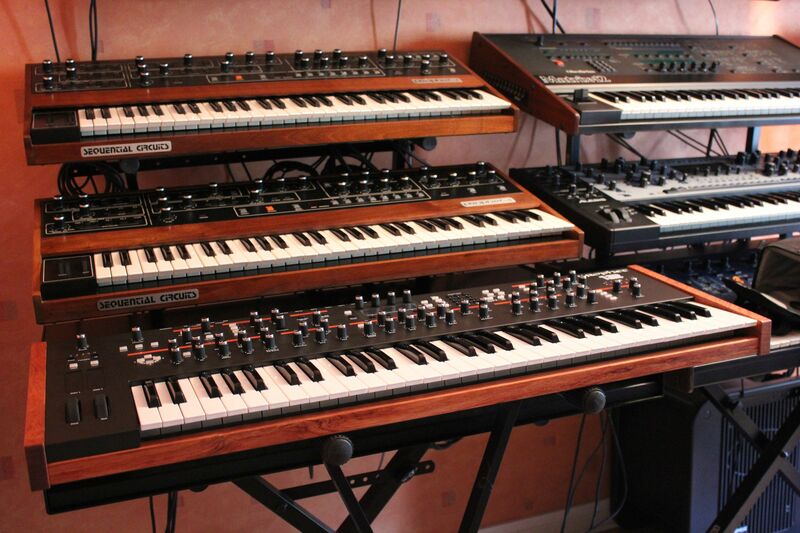 It has nothing to do with a Prophet-5 or even a Prophet-VS, which we had at hand. 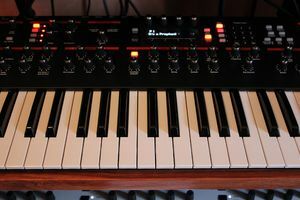 The Prophet 12 sounds very different to previous DSI synths. It excels in cold, hybrid textures, evolving sounds, surgical attacks, FM basses… but not so when it comes to strings, brasses or soft pads. 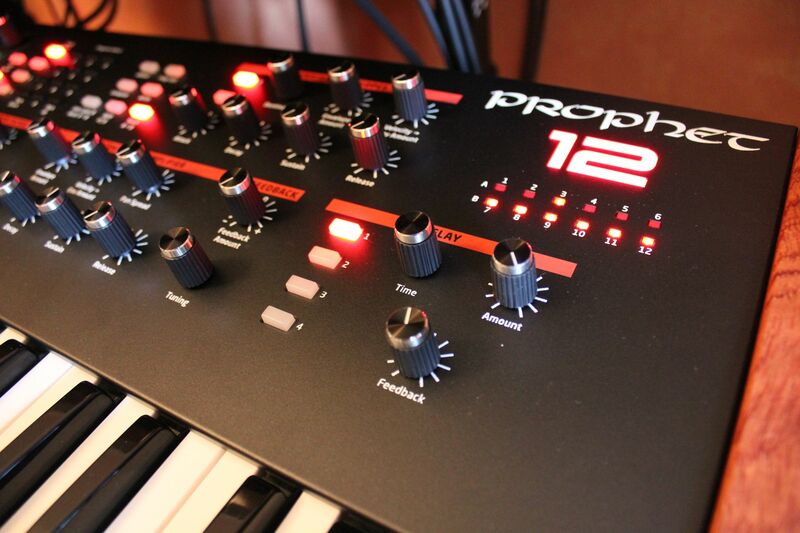 As its name implies, the Prophet 12 is 12 voice polyphonic. It can work in simple mode (12 voices), Split (two separate six-voice A|B programs split at a user-defined point) or Stack (two six-voice A+B programs for the full range of the keyboard). All this is stored in program mode. Voices can be played in polyphonic or unison mode with detuning. In this last case, there are different note priorities: low and high note with and without envelope retriggering. As already mentioned, the Prophet 12 uses Sharc DSPs to generate its sound. Contrary to previous DSI synths, the DCOs of the DSI-120 analog circuit developed with Curtis aren't at all (the low-pass VCF and the VCA are, however, which we will come to later). The signal path has been complicated quite a bit: four oscillators + one Sub (all digital) are mixed and then sent to the digital "Character" effects. 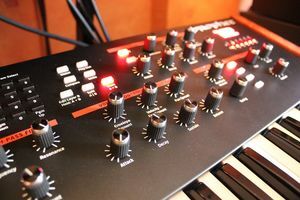 The result is converted into analog before going through two filters in series, low-pass and high-pass, and then landing on a stereo VCA. 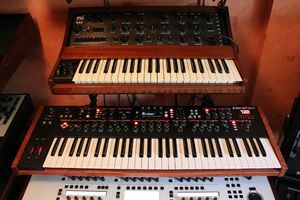 The signal goes out of the VCA, a part is sent directly to the stereo outs, while the other is converted into digital and then sent to four delay lines and a feedback loop. 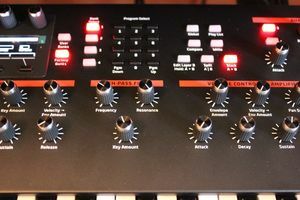 The delay lines are reconverted into analog to be taken to the stereo outputs, while the feedback is reinjected digitally before the "Character" effects. The accompanying scheme illustrates the signal path (without any successive conversions). 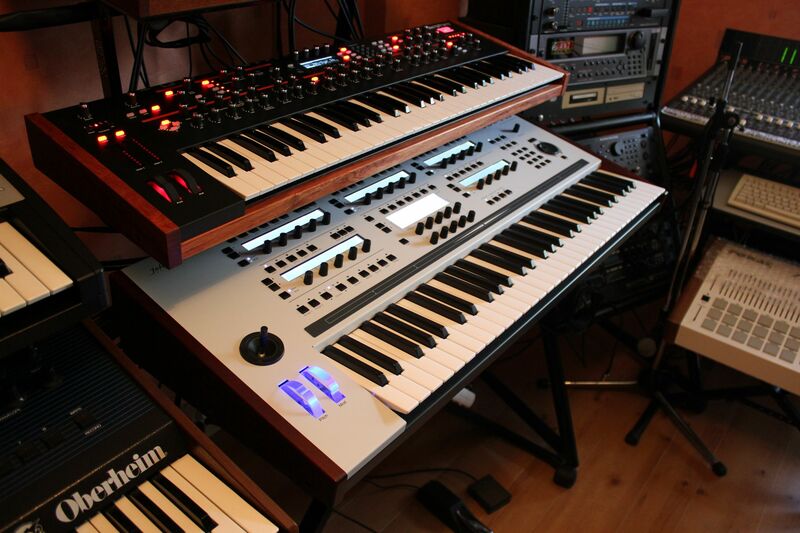 The four oscillators are identical: they span over 10 octaves (8 Hz – 8 kHz) in semitone and 1/100-tone steps. 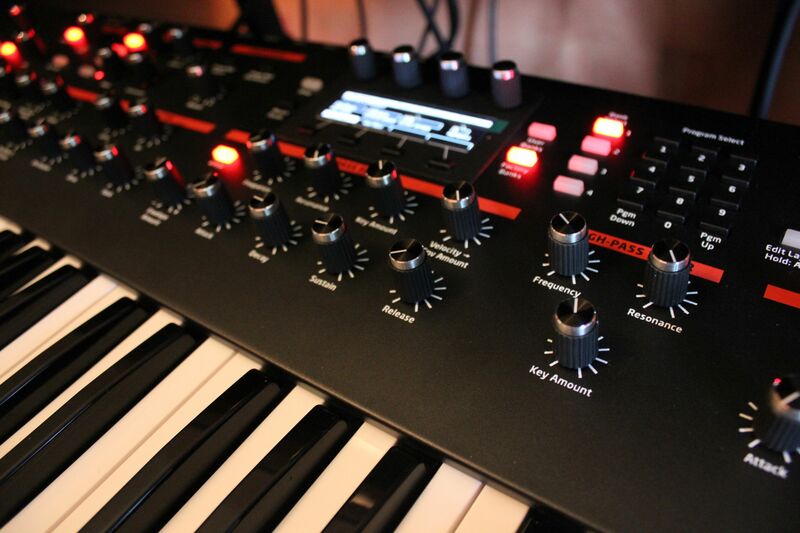 Key follow can be deactivated, which is ideal for certain intermodulations (FM, sync). The oscillator's cycle phase can be free or linked to the pressing of a key. 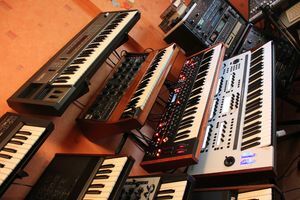 Every oscillator offers four typical wave shapes (sawtooth, pulse, triangle, sine), 12 wavetables (Tines, Mellow, Church, Muted, Nasal, Boing, Gothic, Ahhh, Shrill, Ohhhh, Buzzzz, Meh) and three noises (red, white, violet). All these waves are variable thanks to the Shape parameter that acts on the harmonic content or sweeps the wave table. Even better, the wave tables can work in threes (one to the left, one on the center and one to the right), while the Shape parameter allows us to go progressively from one to the other. The same applies to the noises, except that the left and right waves are fixed. 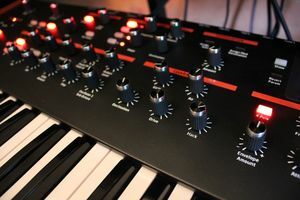 The first oscillator has a basic sub-oscillator: a sine an octave below, just enough to enhance the bass, no more… Each oscillator and sub has a programmable output level that can also be modulated, to achieve a finer mix. The oscillators can interact with each other: hard synced, FM and AM. The modulation order is predefined: oscillator 2 modulates carrier 1, 3 modulates carrier 2, 4 modulates carrier 3 and 1 modulates carrier 4. 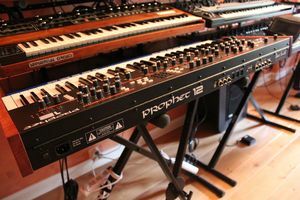 The result of stacking modulations can be surprising, which explains in part the richness in textures of the Prophet 12, especially considering that the FM and AM parameters can be modulated. The timbre is nevertheless metallic, with a lot of aliasing in the highs, like we already described above. It's at this level that Glide (polyphonic portamento with fixed time or interval) and Slop (vintage VCO instability simulation) are adjusted. The Prophet 12 features, for every of its voices, a resonant low-pass filter connected in series with a resonant high-pass filter, without any other routing mode. As we already said before, nor the filters nor the way the signal reaches them is what we would call revolutionary. Even if the analog components of the low-pass filter are the same as on previous DSI instruments (DSI-120), we can't really find that same color. 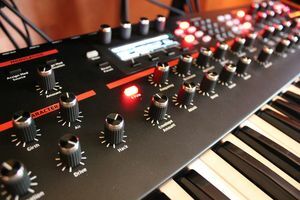 The four-pole mode is resonant up to self-oscillation, but the two-pole mode stays at that and has a very flat coloration to stand out. The resonant high-pass filter is made out of discrete components: op-amp, VCA, capacitors and resistances. It is unfortunately rather dull, but it does however allow interesting attacks as soon as we modulate the cut of the cut-off frequency with an envelope. Again, the resonance colors very slightly, it's not the HPF of the MS20, even if we drive the resonance to self-oscillation with the modulation matrix's DC parameter! Cutting all frequencies, it seems that the oscillators bleed in a more pronounced way than on previous DSI. 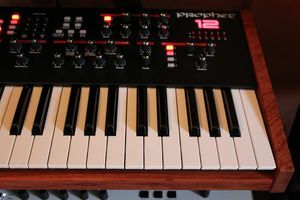 The low-pass filter's cut-off responds smoothly across 13 octaves (165 values). It can be directly modulated by a dedicated DADSR envelope, key follow and velocity. The high-pass filter's cut-off can be directly modulated by key follow. The other parameters of both filters (like resonance) can also be modulated via an appropriate matrix (see below). After going out of the high-pass filter, the signal goes into a stereo VCA. There it finds a dedicated DADSR envelope that can be directly modulated by the velocity. 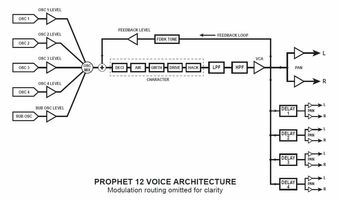 All voices can be scattered in the stereo field and modulated. At the VCA output, a part of the signal rejoins the audio outputs, while another part is converted into digital to go to the delay lines (see below), on the one hand, and to the feedback circuit on the other. 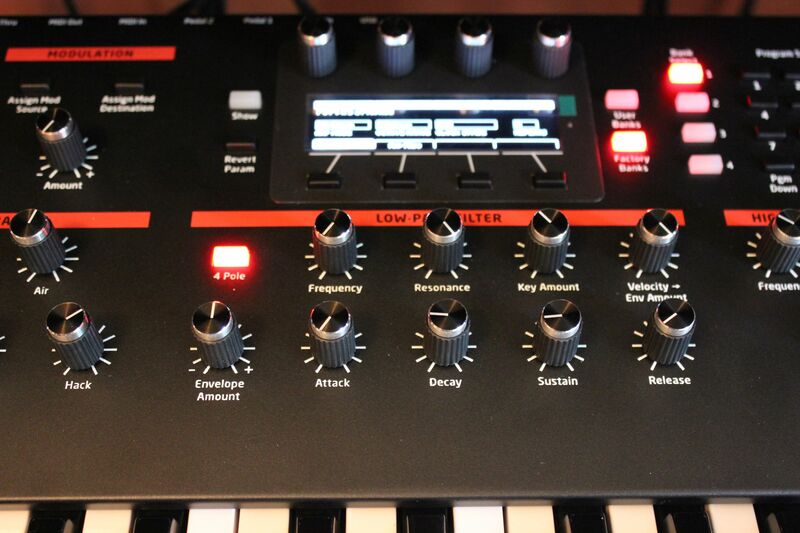 The feedback amount can be adjusted in a bipolar mode, a negative setting corresponds to an inverted signal. 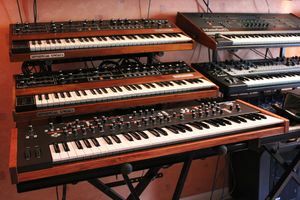 The feedback loop is tunable per semitone for a four-octave range (C0 – C4), the frequency follows the keyboard depending on the high-pass filter's cut-off frequency and the number of poles. Like all DSI products, the Prophet 12 excels in terms of modulations. 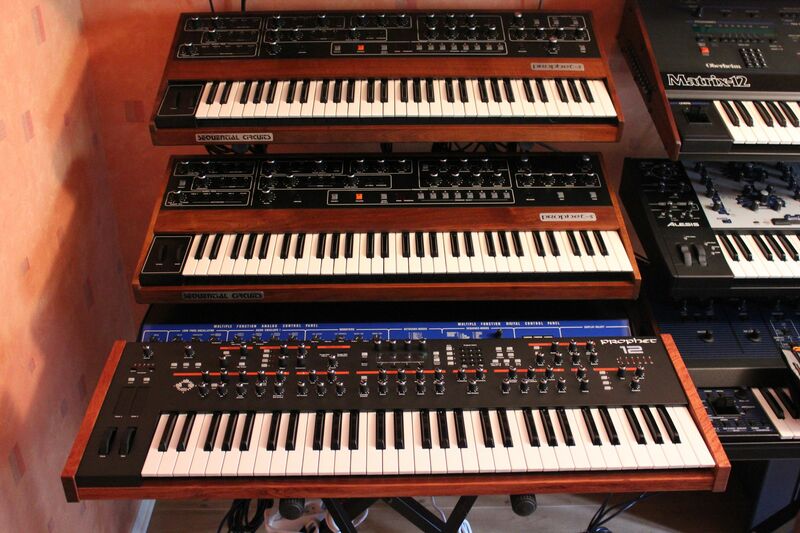 Let's start with the four LFOs per voice. 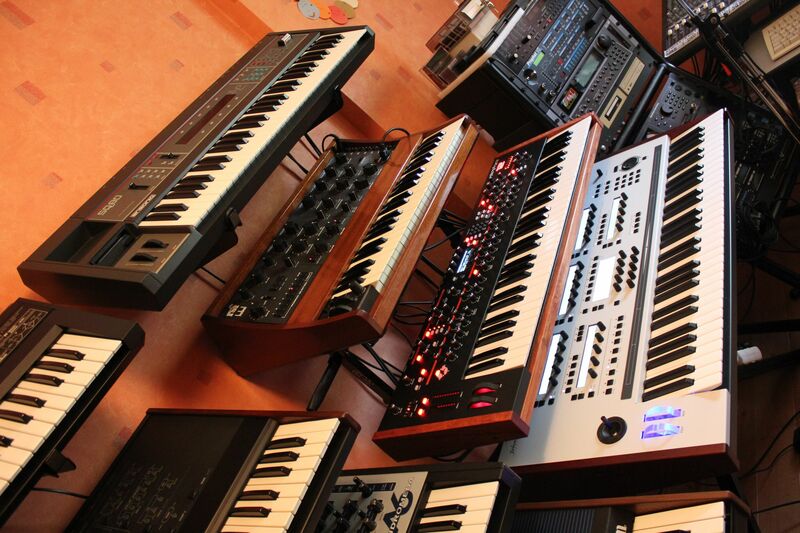 They can oscillate freely or be triggered by the keyboard with its frequency synced to the internal clock or MIDI. The wave shapes are typical: bipolar triangle, reverse sawtooth, sawtooth, square, pulse (three different lengths), and random. We can also adjust the phase and destination (which spares us a slot on the matrix). Finally, a Slew parameter allows us to smoothen the waveform by rounding the rough edges. 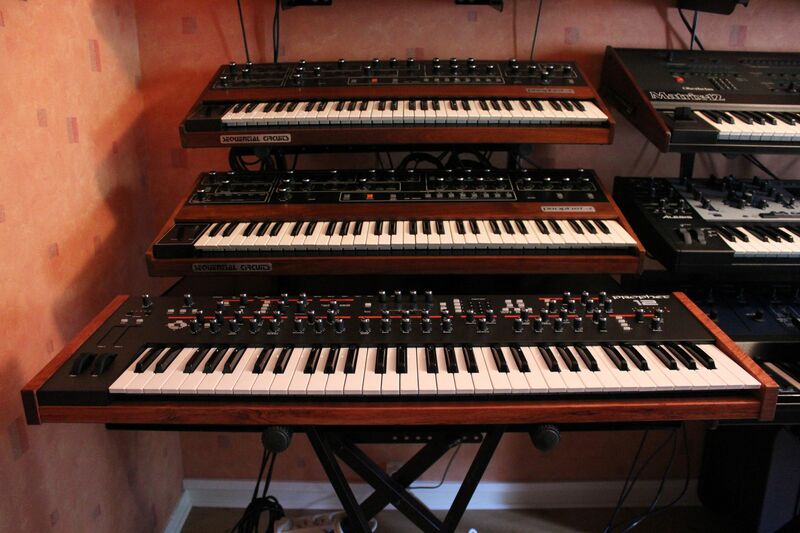 When it come to envelopes, the Prophet 12 has four DADSR. The first two envelopes are preassigned to the low-pass filter and VCA, but they all have a directly assignable destination (without the need of using a matrix slot, thank you again!). The time segments are sufficiently responsive to create twangy sounds, like analog percussions. The envelopes can be directly modulated by the velocity. And it is also possible to loop the DAD segments at will. 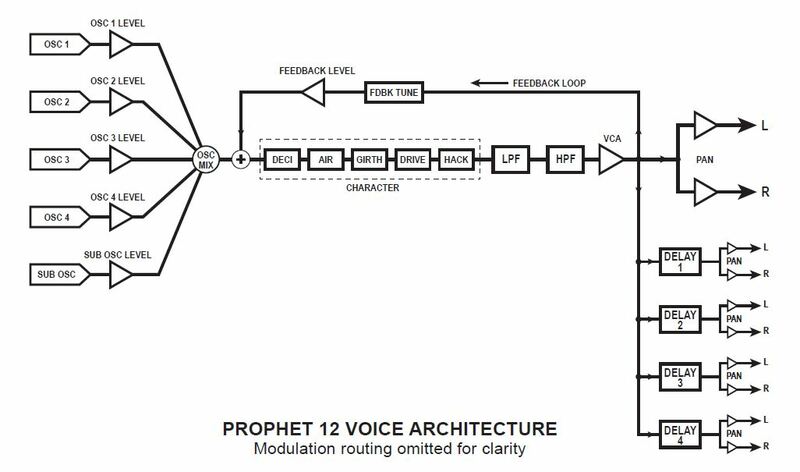 Finally, the Prophet 12 wouldn't be a DSI without a powerful modulation matrix with 16 programmable slots and bipolar modulation amount. It can handle 26 sources and 97 destinations. 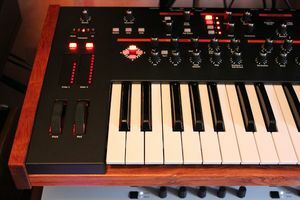 Among the sources are the oscillators, LFOs, envelopes, physical controls, velocity, pressure, key follow, pedals, a random generator, a DC (fixed value)… among the destinations are the frequencies, volumes, wave position, FM, AM of each or all oscillators, the five "Character" effects before filtering, the filters' cut-off and resonance, VCA, pan, stereo width, feedback, four delays, four LFOs, four DADSRs and 16 modulations. In this latter case we create modulations of modulations. 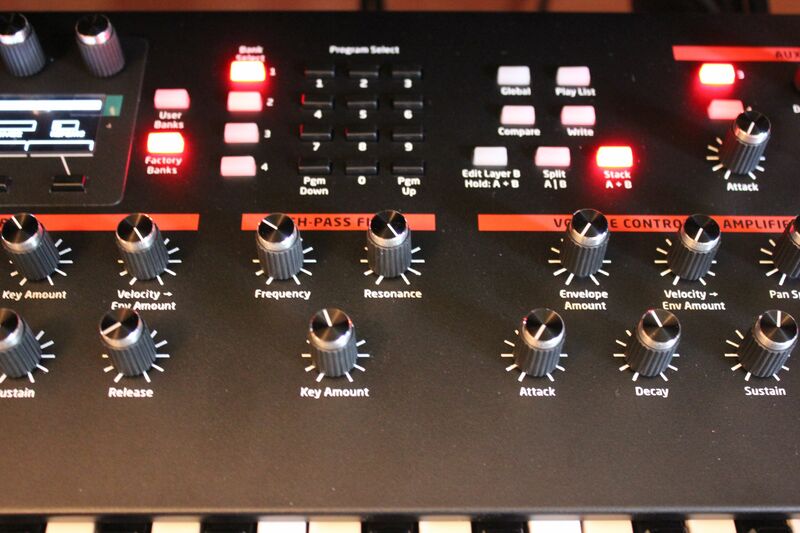 The screen makes editing easier: it displays the slot list, each with its source, modulation amount and destination. The scrolling, as well as the editing, is done via four soft knobs placed above the screen. We can even put the parameters in ascending or descending order thanks to the soft keys placed below the screen. Very practical to see which sources are assigned to the same destination or which destinations are modulated by the same source! 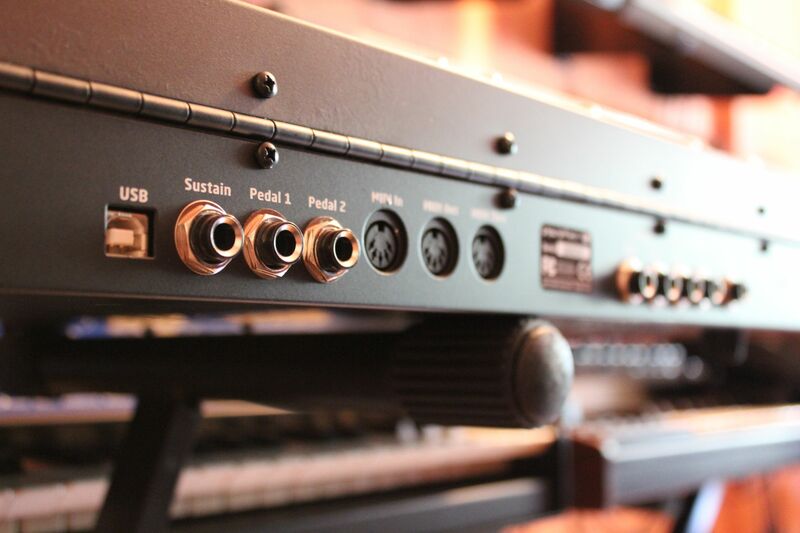 At the VCA output, part of the analog signal is converted into digital to feed four stereo delay lines. Each can be set from one millisecond to one second. The times can be synced to the internal clock or MIDI (four beats to 1/16 of a beat). We can set the amount of signal processed and the feedback. There is no direct control for the pan at this stage, but it can be configured and modulated via the matrix (fixed DC source or variable parameter), to create ping-pong effects, for example. Using all four delay lines we can simulate different effects. For instance, short reverbs (rooms, springs, plates) or even chorus or flanger effects by modulating the delay time. The user manual includes several examples of different parameter settings for different applications. 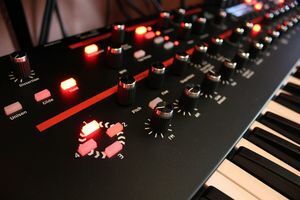 After going out of the delay lines, the signal is once again converted into analog to join the physical audio outputs. At the very end of the chain, the signal is finally sent to an analog distortion controlled by a pot. There's a distortion circuit per sound layer, which allows for independent processing in Split/Stack mode. Each of the two layers of a program has its own dedicated arpeggiator. 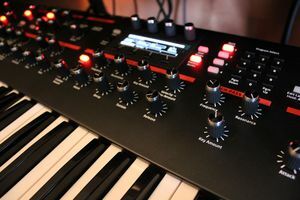 Nothing very transcendental, as we shall see, in comparison to the 32-step programmable one announced at the NAMM! 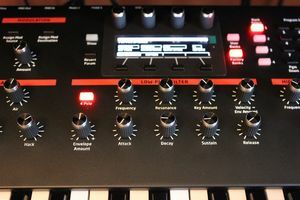 In its current version (at the time of this review, DSI ignored if it would change someday), the arpeggiator makes do with one tempo (with Tap function and internal/MIDI sync), five playback directions (up, down, alternating, played, random), one octave range (one to three octaves), a repeats parameter (zero to three notes) and an advanced Latch mode (holds played notes with substitute or added notes). 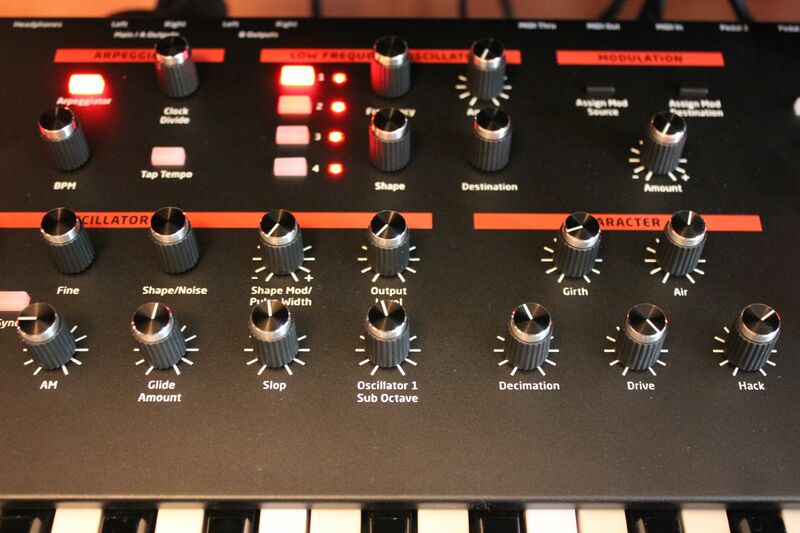 But there's a small glitch: the arpeggiated notes aren't transmitted to the MIDI out, boo! So, in short, nothing new under the sky, especially considering that it can't be made up for with the step sequencer because there isn't any! The Prophet 12 communicates with the external world via MIDI/USB. The buttons and pots on the top panel transmit CC or NRPN, the latter of which allows for a resolution of more than 128 values. 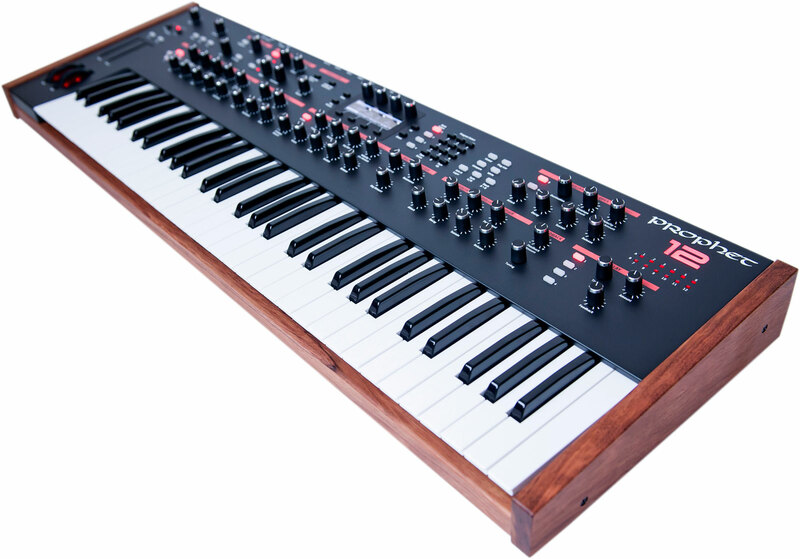 The Prophet 12 can also receive CC or NRPN. In CC we control remotely the main parameters of the layer being edited (A by default). 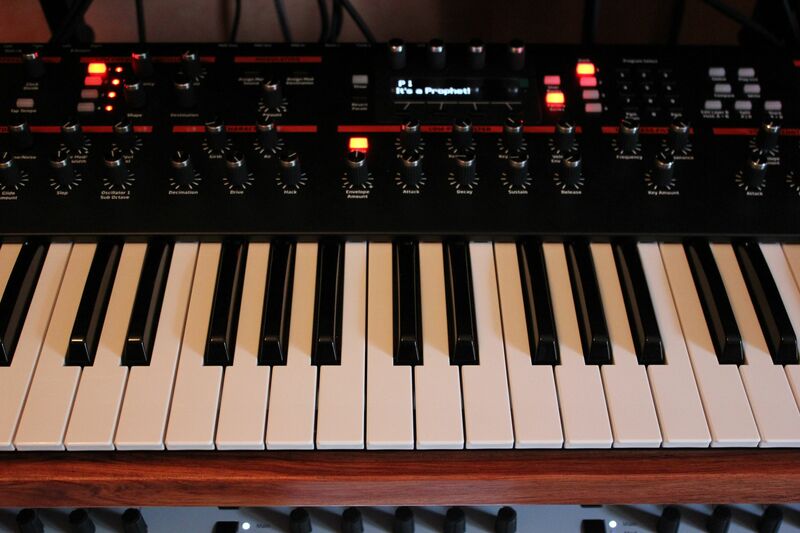 In NRPN we have access to all parameters of both layers on the same MIDI channel. 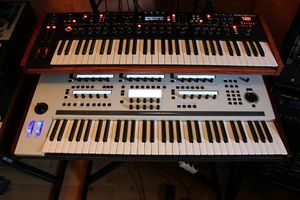 It is incidentally the only way to control both layers, since the Prophet 12 is incapable of working with two MIDI channels at this stage. SysEx is recognized, which is useful to do program dumping. Programs aren't compatible with other DSI instruments, which is logical. 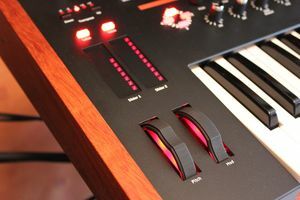 USB 2 is used to repeat whatever goes in and out of the MIDI connectors, it was not conceived to be an interface between a computer and other MIDI instruments. 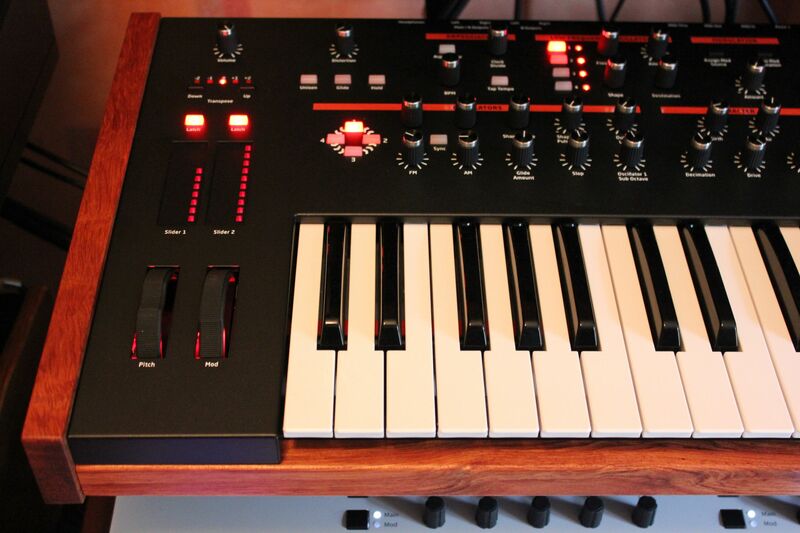 Anyway, the manufacturer does not recommend using MIDI In and USB at the same time, because the synth might crash. 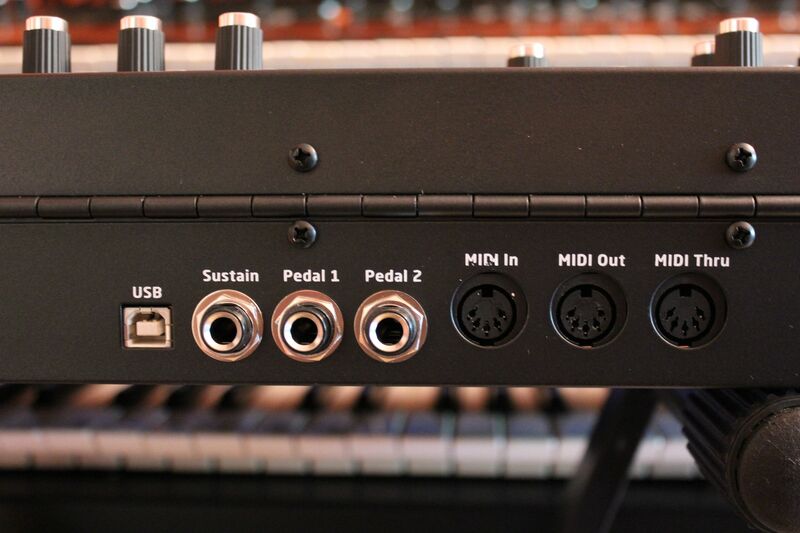 But MIDI out is good. To close this chapter we will mention that there's a PC/Mac editor developed by Soundtower. The Prophet 12 won't leave anybody indifferent. Its design, in terms of look and usability, is really fantastic. 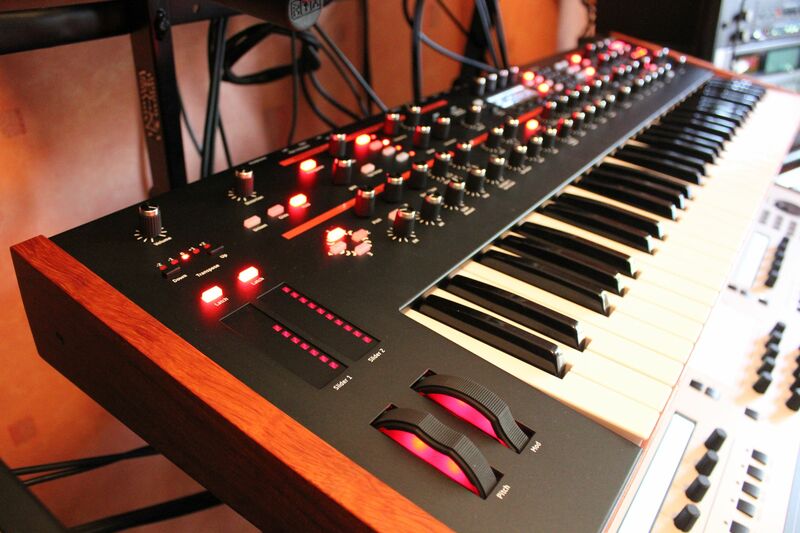 It is, in our humble opinion, the most beautiful instrument we have ever tested. 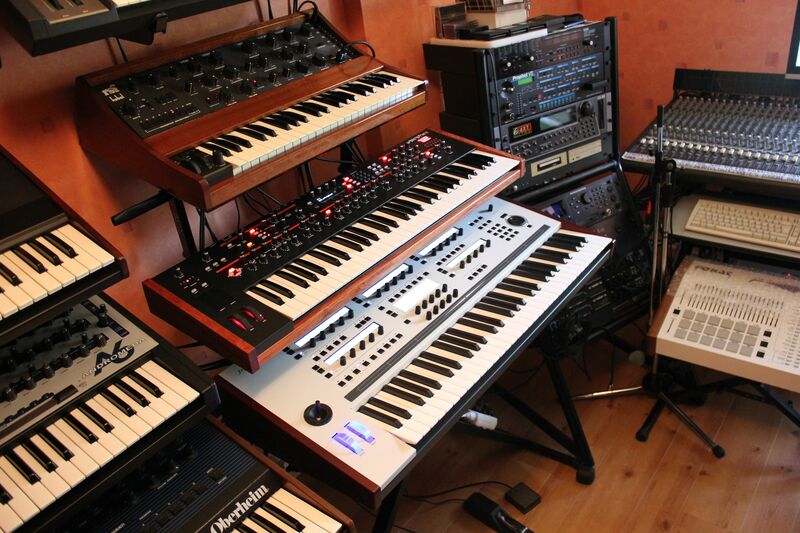 It is also very well built and everything was conceived to facilitate sound research. Which is even more important given that the factory sounds are not the best. 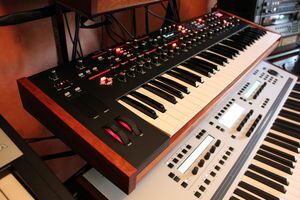 Besides the nice complex pads, percussions, or digital basses where the Prophet 12 excels, it's not easy to get warm, fat sounds out of it like on (partially) analog synths. In short, some will surely think that the performance doesn't quite match its beauty. 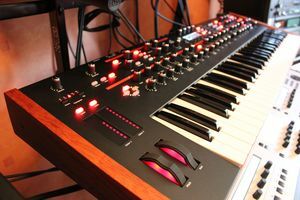 It gives a contrasting impression of a high-end instrument that isn't as versatile as one would expect. 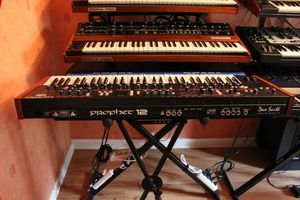 In any case, no substitute for the Prophet’08. Although it just might be that some of us turn more demanding or blunt as time goes by. Finally an internal power supply! We test drive EHX's new "Organ Machine"